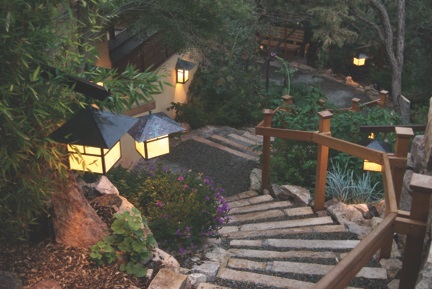 Perhaps the most logical place to begin is at The Spa at La Posada. La Posada, which just became a part of the Luxury Collection of Hotels, is known as the art hotel. This historic property has its own art curator to manage its eclectic collection of over 600 works by over 40 living American artists. The hotel is quite literally a gallery, and collectors in the know come there to buy art at studio, not gallery prices. While the spa is known for its Santa Fe Chocolate Chile Wrap, using local Chimayo red chile and chocolate, I opt for an indulgent 80-minute deep tissue massage to work out some of the knots I acquired during my stressful week leading up to my trip. The following day, I continue to chip away at the tension with a visit to the spa that Santa Fe is probably best known for, 10,000 Waves. This Japanese inspired retreat located, ten minutes outside of town, is a mixture of Zen and hippie, and is a surprising sanctuary nestled in a forested landscape. 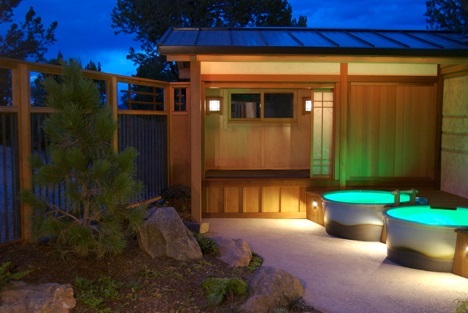 The stand-out feature of the spa is its many hot tubs. Some are communal, some are gender specific and some can be booked for private couple time. There are also shared cold plunges and saunas. For a more upscale experience, book one of the premium hot tubs like Waterfall, where the experience is like bathing in a hot spring in the woods and includes a private sauna and cold plunge with a waterfall. Or opt for a spa suite like Ichiban, featuring two hand-thrown ceramic baths, seated showers, sauna, and something described in the brochure as the “an amazing Japanese toilet that does almost everything for you”. Hmmmm. I decide to try the spa’s newest treatment, the 80- minute Shiatsu Deep Tissue Massage. My therapist Faith tells me that the staff trained on the massage with Masanori Uchida, a shiatsu master for over a year before the service was put on the menu. The version of shiatsu here is different than most shiatsu massages in the U.S. It is almost more like a Thai massage in that I wear loose fitting clothes and no oil or lotion is used. While we often think of shiatsu as a pounding and kneading technique, this shiatsu is gentler, using rocking , pulsing and kneading along the body’s energy channels to encourage “stuck” muscles to relax and let go. While the pressure is deep, the massage is also relaxing and I felt the tension melt away. Also nestled outside the city is the Four Seasons Spa with 15 treatment rooms and a spa suite. The spa is the most luxurious of the three I sample and I like the private casita feel to the rooms. The spa offers a wide variety of services, from regionally inspired things like the Blue Corn and Honey Renewal wrap, which uses these indigenous ingredients to moisturize and soften the skin, to Ayurvedic rituals like the Ayurvedic Attunement. The latter service, which I opt for, The service includes the quintessential Ayurvedic massage, the Abhyanga. This classic treatment uses warm oil pressed into the body to dissolve toxins during the massage. The attunement service also includes energy work in the form of Chakra balancing. Santa Fe is the ideal place to find and enjoy unique art and to treat your own body like a canvas with some pampering along the way.